Meet Zach. He's a cool guy. Like a real cool guy. I met him at a wedding I photographed in North Idaho at Elkins Resort. He at the time was a groomsmen in a very large wedding with his best friend. After the wedding festivities were over me and Zach went down to Hills Resort just down the way in Priest lake. We chatted a bit over breakfast. When I say breakfast I am talking about Bloody Mary's. After spending some time with him I told myself someday when that dude gets married I want to be the one taking photos. A few short years later I get a Facebook message from him stating he found the girl of his dreams and they were having a destination wedding in the calm, quaint town of Stinson Beach, California. Woohoo!! Time to travel. I must say I would love to photograph in this little town on a daily basis. Especially in my favorite month of October which this wedding happened to be. Although the sun was blasting it didn't stop us from trying to find an area with cool shade and foliage. 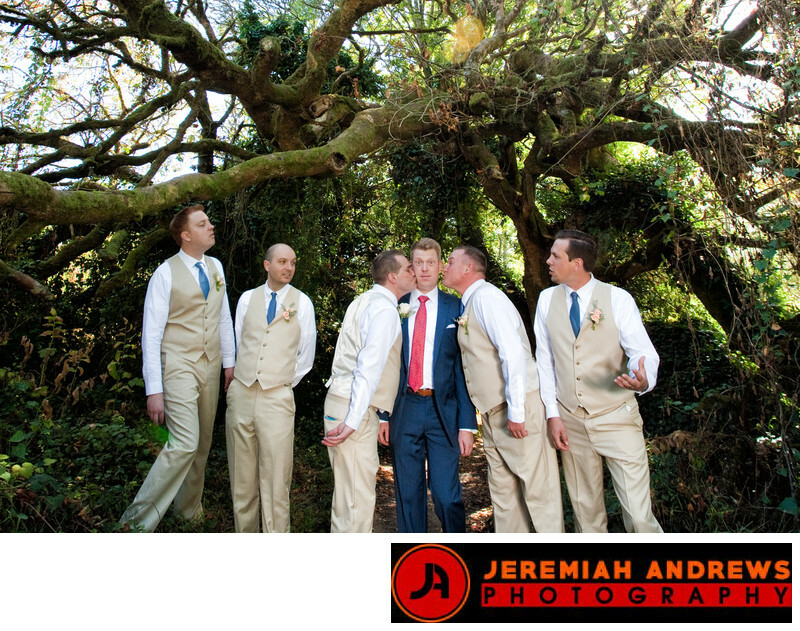 Not to far from the community center was cool hiking trail which is were we ended up shooting the groomsmen photos. What I love about this image is that I haven't had it happen before. With the bride and bridesmaids yes, but never the guys. It was a very candid moment that myself or Zach had no idea was coming. Its at these moments that I enjoy so much. I love when I set up a shot to my specifications and all of the sudden it doesn't go as planned. Not only does it challenge me but also makes me keep my eyes open to the moment before and after the actual shot I thought I wanted happens. With that being said you can see the fun and quirkiness, not to mention awkward expression from Zach that makes this photo one of my favorite groom photos to date. Location: Stinson Beach Community Center, California. Keywords: Destination Photographer in Stinson Beach (3).